What is it about bread? Why am I, here in the middle of my life, so enamored of French loaves? 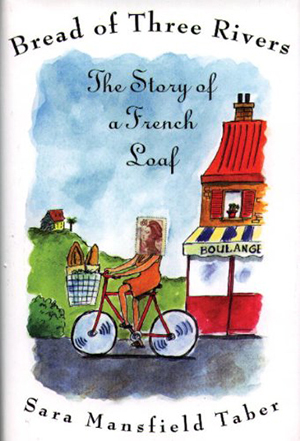 Two images kept cropping up: two French people sitting in a cafe for a long afternoon of eating thick hunks of bread and drinking cups of coffee, and a Frenchman on a bicycle with a loaf slung across his handlebars. These visions seemed to depict lives soaked in leisure, where there was time for the good things. . . . Then this thought ambled forth: It’s the dailiness of bread, like a reliable friend. . . . My plan starts to billow forth. My project, as I imagine it, will be a natural history, an ecology of bread. The story of a loaf. Overcome by a passion for French bread, Sara Mansfield Taber travels to Brittany in search of a loaf, which like the lifestyle that must surely accompany it, is perfect in its simplicity. After many months of seeking, she tears off a hunk of pain trois rivieres, made by Gold Medal baker Monsieur Jean-Claude Choquet of Blain, Loire-Atlantique. It “smelled like heaven and tasted a mile deep.” It tasted honest. Here was her loaf. In Bread of Three Rivers Taber takes us deep into the grainy crumb, uncovering the four basic ingredients-the salt, water, wheat, and yeast-that when combined by M. Choquet make for a spectacular loaf. We learn of the marshy fields of Guerande where for hundreds of years salt, blessed with a unique mixture of microbes and minerals (that lend their flavor to the bread), has been harvested with the help of the sun. Then we’re off to Moulin de Pont-James to meet the miller, who whispers to Taber that he actually uses strong American wheat from North Dakota to fortify the local harvest. Then to Nantes to engage the organic wheat farmer. In Nort-sur-Erdre we discover an ancient natural aquifer, composed of sand and limestone somewhere between 8 million and 50 million years ago. We end our journey in Lille at the Lesaffre Yeast Company, where the alchemy responsible for everything from American white loaves to Turkish flatbread is revealed. A deliciously satisfying mixture of history, science, travel narrative, and romance (could anything be more powerful than bread love? ), Bread of Three Rivers reminds us that nothing, no matter how basic, is as simple as it would seem.